NEWPORT, RI (August 30, 2017) - Sail Newport, along with a slate of dignitaries, officials, and supporters, celebrated the opening of its new Mid-Park Marine Education and Recreation Center today. Over 200 people joined Executive Director Brad Read for a ribbon cutting ceremony, including Governor Gina Raimondo, Senator Sheldon Whitehouse, Rhode Island Department of Environmental Management (RIDEM) Director Janet Coit, former Senate President Teresa Paiva Weed, Representative Marvin Abney and Rob MacMillan, co-founder of 11th Hour Racing among other city and state leaders. Sail Newport center after official ribbon cutting today. 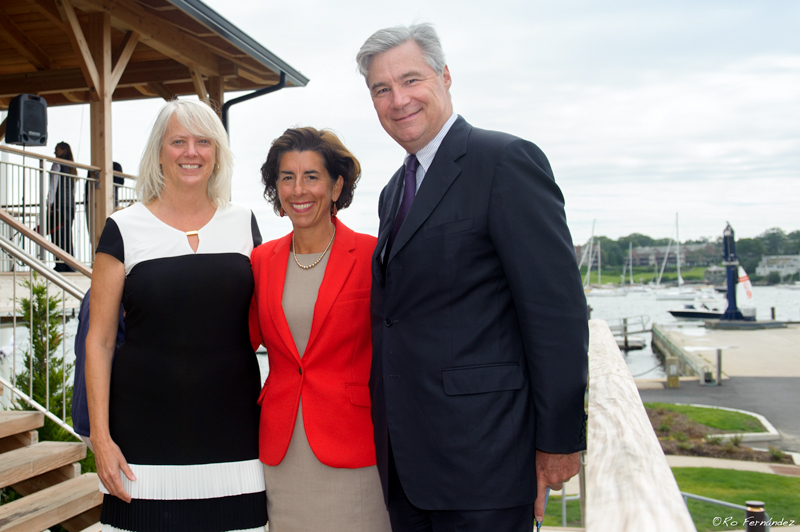 "This is a center truly worthy of the Ocean State," Raimondo said. "The state-of-the-art sustainable design will allow Sail Newport to bring the magical experience of being out on the water to more Rhode Islanders. In particular, the center will teach our younger generation that these natural resources are gifts we must protect and preserve for the future." The 8,500 square foot LEED-compliant building located in Fort Adams State Park was conceived, designed, engineered and built with support and guidance from the State of Rhode Island and many construction and sustainability partners. In addition to sustainably-resourced materials and a flood-resilient design, the new center operates with energy-efficient heating and cooling, solar power, and a rainwater harvesting system for irrigation, boat wash and restroom water. "I am thrilled to celebrate the completion of the Mid-Park Education and Recreation Center at historic Fort Adams State Park - a place of profound beauty and culture and home to exceptional recreation, facilities, and marquee events," says Coit. "Beautiful waters and greenspaces, breathtaking vistas, and world-class boating - all of which surround you at Fort Adams - are hallmarks of Rhode Island. They are an intrinsic part of life here. And they attract streams of people and opportunity to our state," she adds. "Kudos to Sail Newport and all partners involved in making this project a reality and continuing to enhance and promote Fort Adams as a destination. I look forward to the many public programs and opportunities Mid-Park will offer - and the love of sailing and enjoyment of our parks that it will help inspire," Coit adds. The growth and progress of Sail Newport, which was founded in 1983 after the loss of the America's Cup, prompted the organization's leaders to set a goal five years ago to expand their public access sailing programs and marine education for the community. The new center was designed to facilitate more education with year-round classrooms and restrooms and an upgraded facility in order to offer more public sailing programs and more access to the water for all ages. "The State of Rhode Island, DEM and many generous donors have brought us to this day," Read says. "Not only do we now have a sustainable headquarters, this new center will serve the community with more public access sailing programs and access to Narragansett Bay," he adds. Read notes that the first program to use the new center will be a fourth-grade learn-to-sail educational initiative with the Pell Elementary School which starts on September 18. The program was developed by Sail Newport and Donna Kelly, a Newport Public School teacher and former board member of Sail Newport, and Superintendent of Schools Colleen Burns Jermain. The unique program will align with the public school's fourth-grade core curriculum in the areas of math, science, social studies and art. In addition to the on-the-water classroom of sailing instruction, the new indoor classrooms will house students for the land-based curriculum portions. Sail Newport also partnered with 11th Hour Racing for the design of the building to include sustainability at the heart of its sailing center operation and green events and programs. It was announced almost a year ago that 11th Hour Racing granted $1million towards costs for the new center. "We are thrilled to see the grant that 11th Hour Racing awarded to Sail Newport in 2016 come to fruition, with the new Mid-Park Marine Education and Recreation Center ready to welcome and expand Sail Newport's educational programs, while integrating the message of preservation and maintenance of our ocean and shoreline. Since 2010, 11th Hour Racing has been harnessing the power of sport with an innovative and comprehensive approach, and this new sustainable headquarters is a testament to our core values centered around environmental and social responsibility," says MacMillan. MacMillan adds, "We exist to provide public access sailing programs and services. The new center will have a positive impact on all of our community-based programs that we provide at low cost or no cost to other non-profit organizations. He adds, "Most importantly," he says, "we hope to inspire all sailors as to the importance of preserving and maintaining our ocean and shoreline." Ample large functioning windows and a clerestory allow for natural light, passive solar in the winter and cooling sea breezes in the summer. This drastically decreases the overall energy consumption of the building year round. The ground floor is constructed with flood resistant building materials. It is also equipped with flood vents that allow water to pass through the building during a flood event and prevent structural damage. The first floor is elevated on Pearson Pilings with a 5.5 feet freeboard safety factor; "freeboard" tends to compensate for the many unknown factors that could contribute to flood heights greater than the height calculated for a selected size flood conditions, such as wave action. Freeboard also results in significantly lower flood insurance rates due to lower flood risk. All sensitive mechanical and electrical equipment, including the elevator machinery are located above the flood plain. Restrooms contain a check valve/back flow preventer for use during flood events to stop floodwaters from entering the municipal sanitary sewer system. The systems also prevent untreated wastewater from being discharged in the environment during flood events. The structure above the ground level is constructed of exposed Douglas Fir heavy timber, a natural certified wood product. Solar PV System Between 50-60 solar PV panels will be installed on the roof to provide a percentage of the building's average annual energy consumption. The building uses a rain harvesting system to collect storm water from the roof and minimize runoff. The downspouts from the roof gutters are directed to a 10,000-gallons below ground storage tank. This water will be used for irrigation, flushing plumbing fixtures and controlled wash-down of boats. The system also uses a filter system to control debris and protect the plumbing fixtures. Structural Insulated Panels Structural insulated panels (SIPs) are a high-performance building material. SIPs are manufactured under factory-controlled conditions. The result is a building system that is extremely strong, energy efficient and cost effective. Linoleum flooring is made with natural materials, anti-bacterial and biodegradable. Series A are the most energy efficient coastal windows available. Hidden structural reinforcements increase performance without sacrificing aesthetics. This storm resiliency is increased because the design was above code. Hardie Plank Siding Made of wood pulp, cement, sand and water, Hardie Plank is a sustainable siding option. Bike Racks Sail Newport will be collaborating with Bike Newport to encourage people to leave their cars at home. The entire building is outfitted with: energy efficient heating, ventilating, and air conditioning (HVAC); LED lighting - CommandScape's control system for lighting, and climate control and energy monitoring; efficient kitchen appliances; the paint used is Zero VOC Paint. Carpets in offices are selected from a green material. Counters in kitchen/bathroom on first and second floor are made with recycled glass.